I was staying near the beach, so I had the chance to go out while the shadows were long and the light was soft. I’ve been meaning to publish this one for a while, and I finally got the spur to work on it. Photographers out there may have heard that Google is giving away their Nik collection of software for free. I’ve been using Nik Silver Effex for some time. 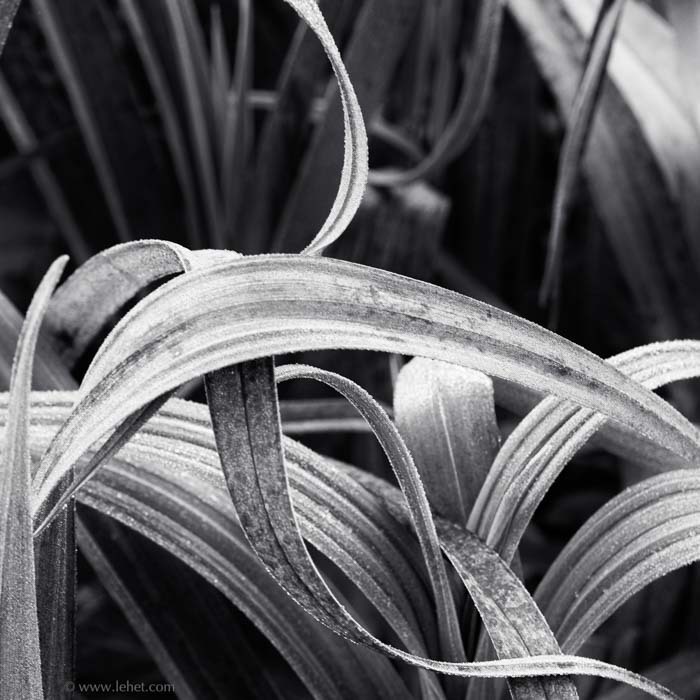 If you’re careful not to get too carried away with its power, it offers some nice additions to a straight conversion to black and white, some ways to get the tones just right. Silver Effex has been crashing on me a lot lately anyway. I was working on making an output file for a print that sold the other week, and it must have crashed 30 times or more, and it was a large file to reopen each time. Ugh. So I took this news as an opportunity to move on. A new one I’m trying, called Tonality CK, does not crash. So I’ve been taking it out for some trips around the tone poems. This is one. 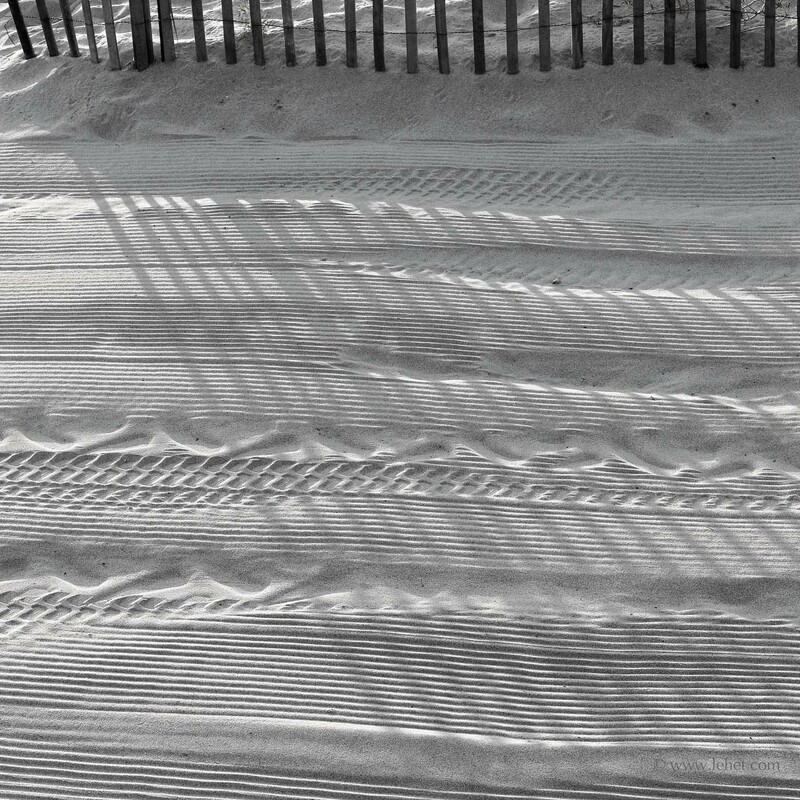 This entry was posted in Abstract, Beach, black and white, summer, travels on April 5, 2016 by john lehet. A few weeks ago I had a chance to make a collection of small matted/bagged prints for a flip-through bin at Frog Hollow in Burlington. They only wanted infrared prints. That’s a little bit of a funny restriction for me, because I usually consider the infrared to be more like an extension of my palette rather than a separate realm. Anyway, I was very glad to have the chance to do it, and I treated it as a little show. Usually in a show I’ll work from a range of prints that I know work, to something very fresh, new to me. I take it as a chance to stretch out and push myself, which is funny, because I can do that any time. For this show, this image was one of the new ones, and I was very happy to see it come out of the printer. I printed it on Canson Rag Photographique, a slightly textured matte paper, just a little smoother than etching paper, but still with a very nice tooth. After that I was printing some things with a different ink set in the printer, for “luster” paper rather than matte. Then when I had to switch inks again (a process that is a little expensive) for a print sale last week, I decided to print that infrared print bigger on the different luster paper (Canson Baryta Photographique) to see if it would have different qualities. Yes, a very nice print indeed. In the old days, when I carried around a view camera with a bellows, dark cloth, and boxes of film-holders, I used to also expose infrared film. It was a tricky and squirrely business back then, often failing. So even if I “saw” the image as infrared, I would also expose some regular sheet film as well, just so that I might get something, or in case it worked better on black and white tri-ex or plus-x or T-max or whatever. That’s a habit I carried forward, but the difference now is that the infrared isn’t always the hardest to manifest. At least last year the most difficult camera I used was the Nikon D800e full frame, trickier to get a good image than with the good reliable Olympus or even the infrared. Often on a given subject I might work with three cameras. I looked through my catalog to see if I had made the exposure with the full frame rig, and I had. And I got a good one! With the infrared reading informing my vision, I rendered this as black and white. It’s very hard to decide which of these I like better. 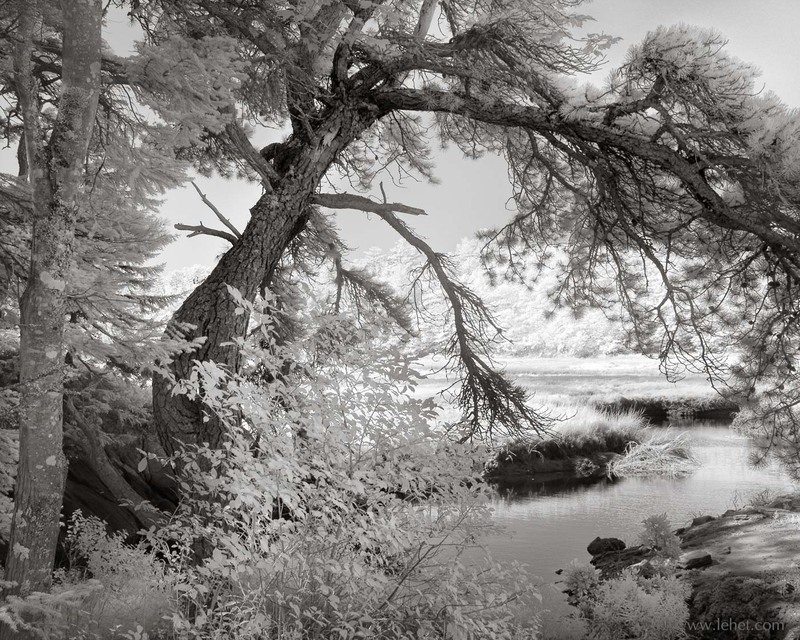 I think for a small image, the infrared might have it, but the full frame version has much more detail, and it will make a much better large print. In a previous blog post I wrote a bit about how I am letting go of my notion that each situation or scene can only have one definitive print. More and more I’m opening up to letting it be OK to let any particular vision expand a bit into its various facets. 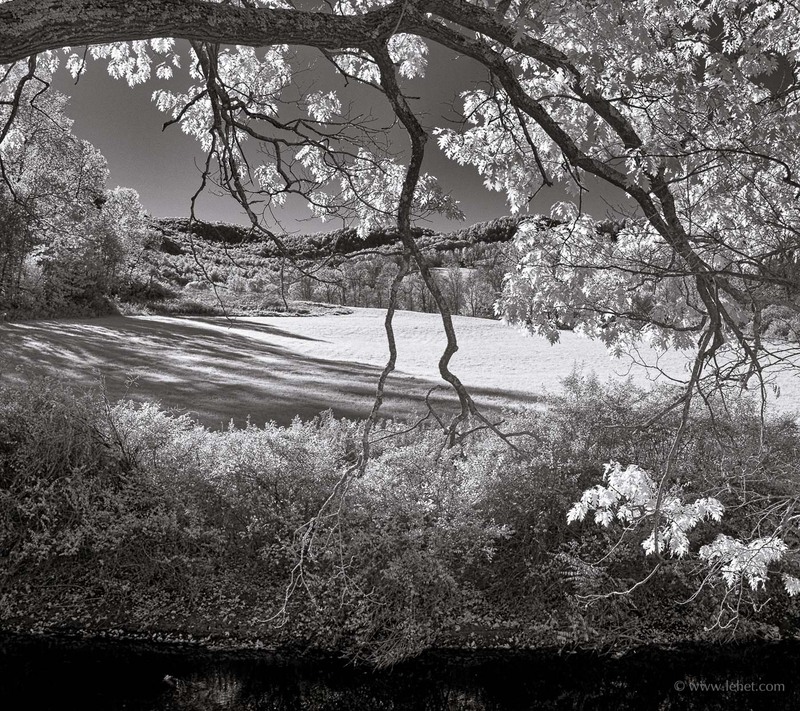 The infrared version is for sale in various sizes here. And this is from the higher resolution regular color exposure. 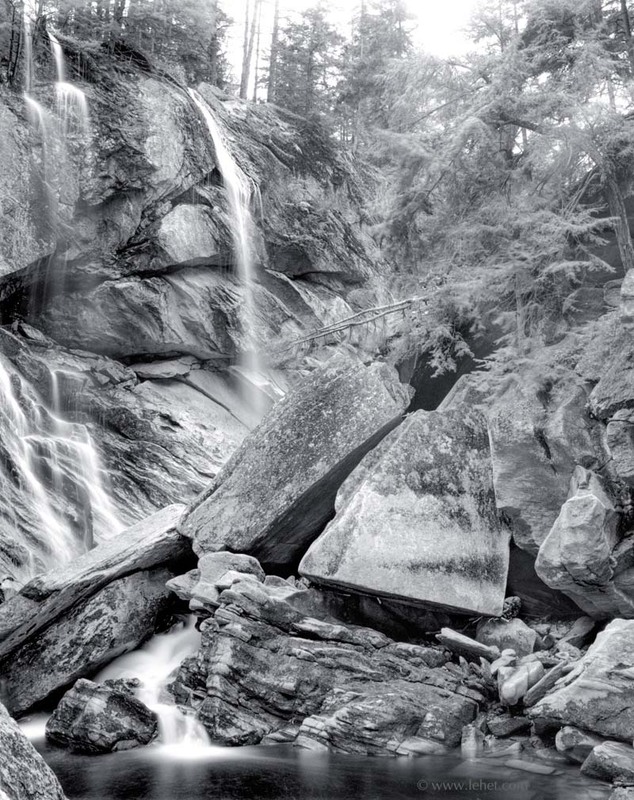 This entry was posted in black and white, New England, summer, travels, Water on March 22, 2016 by john lehet. Anyone who has spent any time at all honestly examining their mind and experience knows very well that most of the time most of our awareness and attention is not directed at the situation at hand. So it was that I started the day of New Year’s Eve, 2015. I was looking forward to photographing at Post Pond a bit later in the morning, since I was scheduled to be in my old town of Lyme NH at 10. I figured I would leave early and give myself a generous amount of time there to photograph before 10. 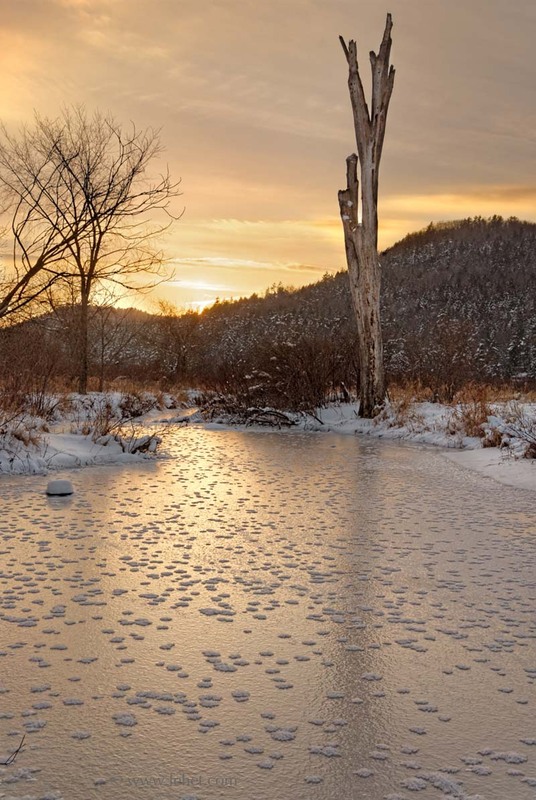 Here in Hartland VT the trees and weeds were glazed with ice from freezing rain the night before. The light was soft but bright, and there was some fog and mist in spots. A good opportunity! I had to spend some time here before I headed to Lyme. I made way too many photographs right in the back yard, and heading off I was just barely going to be on time. But I still had to stop and expose the image above. It turned out that as I approached Lyme, the ice storm was not in evidence, the light didn’t have the luminous quality that we had in Hartland. My 10am appointment was to gallery-sit at the Long River Studios gallery. After that was over I went to Post Pond, and — nothing inspiring. I could spend some time and find something, always, but it was not as it had been in my mind. There wasn’t even any ice on the water. 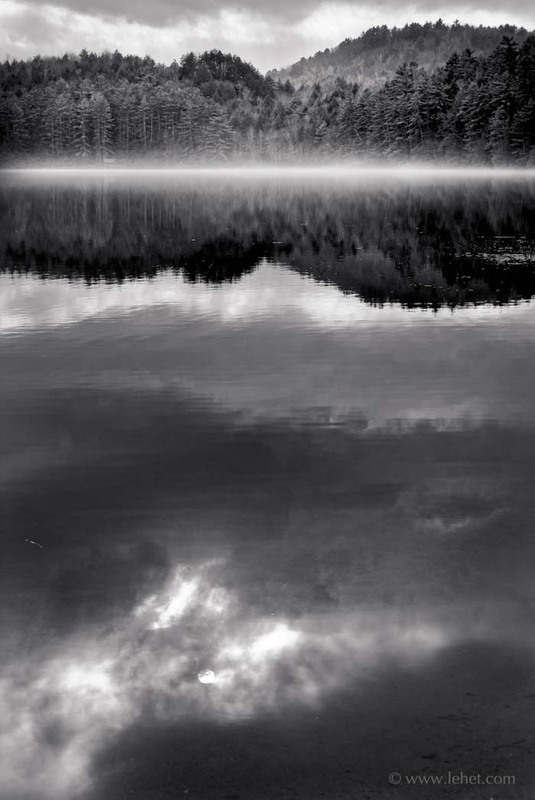 But in honor of my fantasy of how it was going to be, I’ll resurrect an old exposure of Post Pond — sort of how I thought it would be there. It’s kind of funny, because I’ve been wanting to go back there with my newer, higher end cameras and lenses, but that gear didn’t help with nothing interesting in front of it. The photo below (which I will not be able to print very large) was exposed with my earliest DSLR and the worst lens I ever owned in 2005. It worked out. Sometimes the situation works out if you’re fully in it. 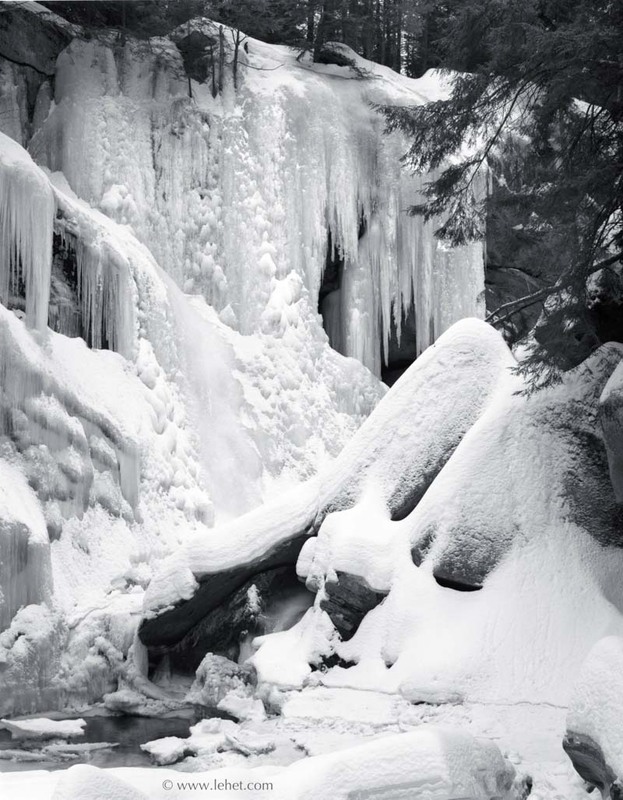 This entry was posted in black and white, New Hampshire, Post Pond, Uncategorized, Vermont, Winter on January 11, 2016 by john lehet. That series, which I love, was quite a breakthrough for me. I had quite a lot of wall to cover, and short notice to hang the show. I had enough framed prints around to do it, but I wanted to include a lot of new work. This series was really new in several ways. I had never printed or even post-processed these images, or thought of doing it particularly. In spite of feeling challenged in the past to create series of images that cohere, I set that as my task: not only would they cohere, but they would essentially be one unit, carrying a theme of a curve that would reverse from image to image, undulate through the series, and switch out different textures and tones that all related. I had four square frames with glass I could use, and about a 6 foot stretch of wall to fill. It was a bit of work scouring through my catalog and trying different things out, and then printing and framing right up to the day I promised I would hang. I was thrilled with the result. Just this week, I realized that the four squares was a somewhat arbitrary series, based on that wall space. Maybe it was perfect, but I decided to try to extend it. 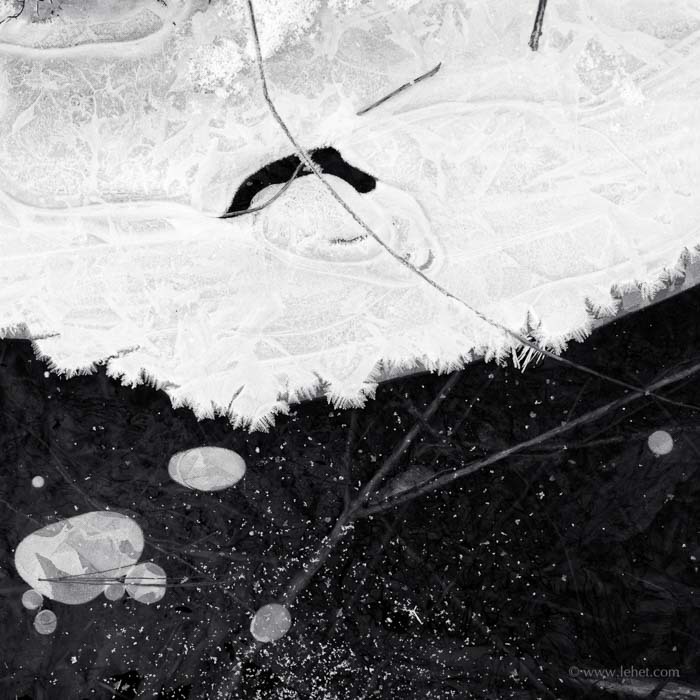 I’m also happy about the photos I included in it as stand-alones; and each of the series works as its own image. The series is for sale as a set of 10 x 10 prints or a set of 12 x 12 prints for a discount price over individual prints. 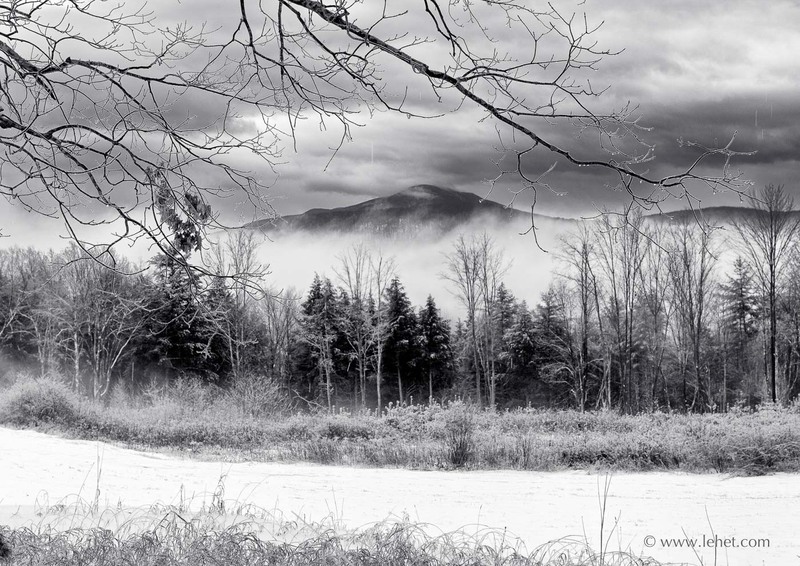 This entry was posted in black and white, New England, Vermont on December 24, 2015 by john lehet. They say you can never go back. 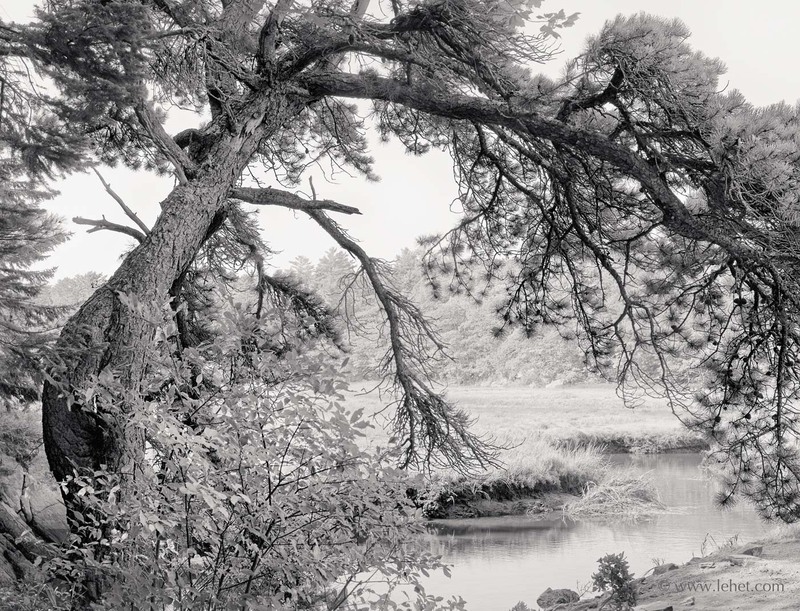 The other week when I traveled to Lyme to drop a print at the Long River Studio gallery there, it was a real flashback, and I wrote about it some here. It was so funny, being there in a different mind, the place the same but different, even walking past my old house across from Clay Brook as I walked along the brook, the outlet to the pond. It’s also sort of the same going back through the old exposures. The file from 2006 is the same raw data from the camera sensor. The sensor and lens I had then wasn’t as good as what I have now, and my vision and mood is different. But mostly I think my eye is a lot better, both to recognize and develop images. I guess the main point is that even if I’ve got an older file, sometimes it’s like I just went back there with the camera and found something new. May it always be so. May the past, present, and future always be seen freshly. 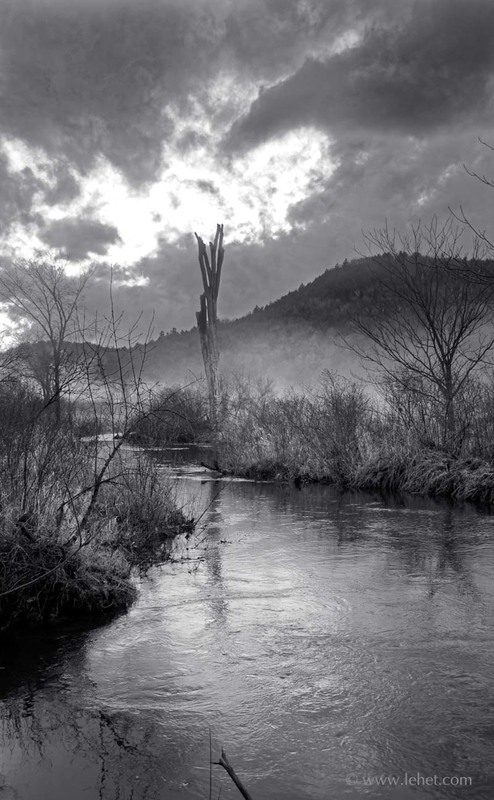 This entry was posted in black and white, New Hampshire, Post Pond, Water on December 17, 2015 by john lehet. Usually we think of en epiphany as a flash of insight that happens in, well, a flash. But I think really when it happens it’s been building, maybe for a long while. I think it’s true in meditation practice, as we build insight and capacity to experience, those sudden flashes are really just fruition that’s been on the way for a while. 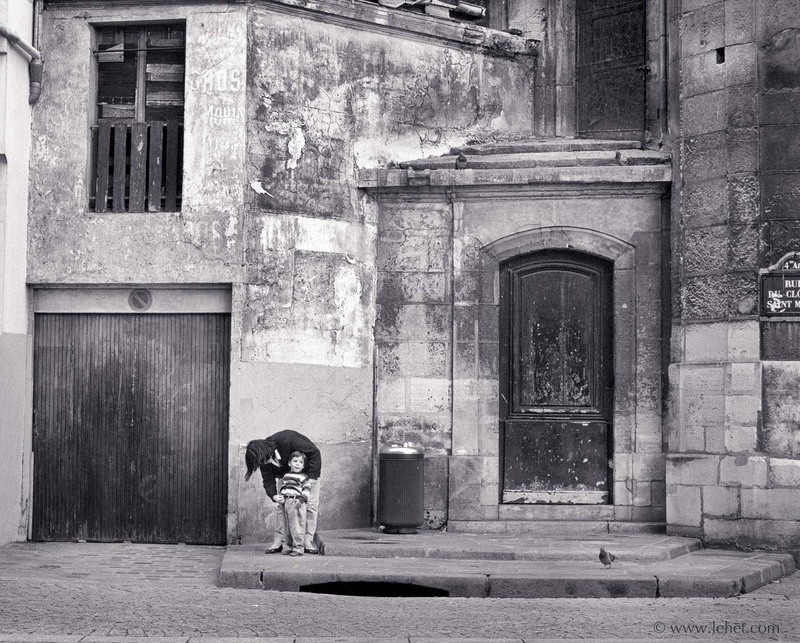 In photography, from the early eighties I tended to visit and revisit certain spots. Some places, just something about them: photographs just crystalized out of the situation almost every time I was there. The light always different, my eye, my mood, the way the I Ching would toss — everything different though the same place. So, I knew that, and I did it, all my life. It was only last fall hanging a show of photos at the Ledyard Gallery of the Howe Library in Hanover New Hampshire that I realized it was really cool how different images from the same vantage point were completely different. Those were all of Post Pond, in Lyme New Hampshire. But no. There is no definitive photo, even standing in about the same spot, even at about the same time of day. And that is part of the point. 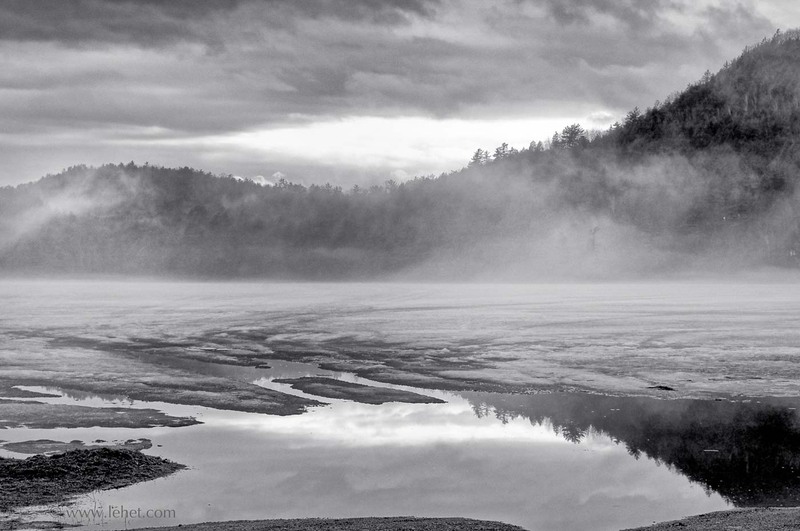 This entry was posted in black and white, New Hampshire, Post Pond, Water on November 9, 2015 by john lehet. This is a scan from medium format film, breaking any recent continuity this blog may have had. This image was awakened from the vault by my daughter’s current trip to Paris. I loaned her a real camera and showed her how to change the aperture and exposure compensation etc, so I’m excited to vicariously imagine seeing Paris again. This was in the mid 90s, this guy, getting his pants adjusted by his mom, is now hopefully a grown man. I don’t know if this wall or anything looks remotely similar anymore, of course. That trip in Paris I carried a heavy bag with a Pentax 6×7 medium format camera, light meter, monopod, and a couple of lenses. Crazy. I may have a handful of photos of the week this week — we’ll see. This one took a lot of time because of all the film spotting, taking up far more bandwidth than I had planned. I’ve got to get busy, because I’m hanging a show in early October at Dartmouth Hitchcock Medical Center. Off to work! This photo is for sale and can be viewed larger (and in retina) here. 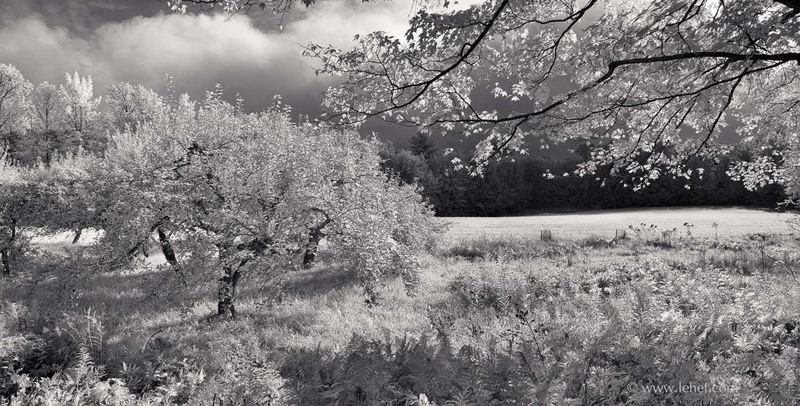 This entry was posted in black and white, people, travels on September 16, 2015 by john lehet. I’ve been putting together a lot of panoramas from files lately and finding a lot of gems I hardly knew I had. I had tried putting this one together in the past, but somehow I didn’t have the chops to pull it off, or I couldn’t get my mind to visualize it properly. I thought it didn’t work. This time I think it really works! This image is for sale and can be viewed in higher resolution here. 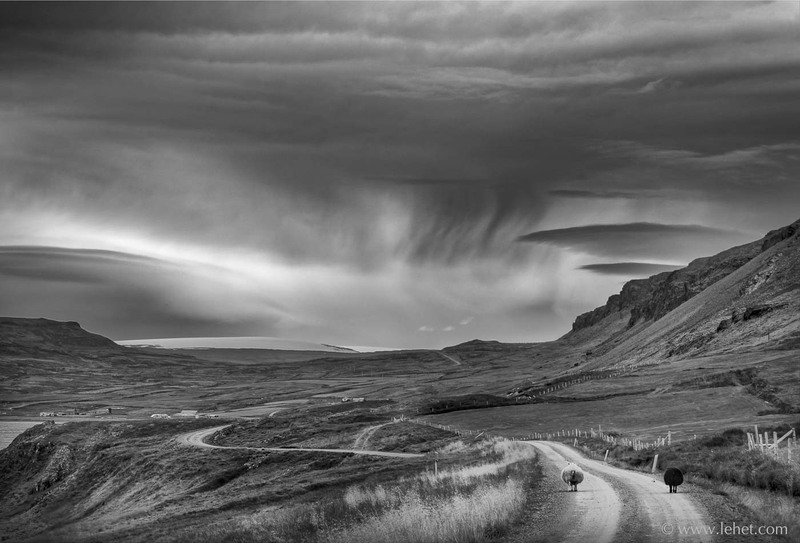 This entry was posted in black and white, Iceland, Infrared, travels on August 6, 2015 by john lehet.